Ipad2 in south korea stock runs out. ~ " World Information "
Jakarta - As in other countries, it seems iPad 2 also get a warm welcome in South Korea (ROK). Two of the top operators in the State Ginseng is even up to stop selling iPad 2 via online while time because of shortage of supply. 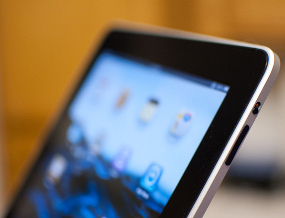 Although not quite a week iPad 2 went on sale in South Korea, SK Telecom and KT Corp. claim could not freely sell that second-generation Apple tablet because its supply is very limited. Similarly, as reported by Reuters and quoted on Wednesday (04/05/2011). "Inventories iPad 2 we have gone and we apologize for not providing an adequate supply because of lack of global supply of these products," said SK Telecom through his website. No doubt, popular tablet sales Apple is getting stronger. Debuting in the United States on March 11 last, Apple is rumored to have been successfully sold nearly half a million units iPad 2 in the first week sales. Apple stepped up marketing iPad 2 to 25 countries on 25 March and as expected, this tablet sold swiftly. In South Korea alone, IPAD 2 starting present on 29 April. Apparently, Apple has yet to cope with demand iPad 2 which exploded. Companies owned by Steve Jobs was reportedly experiencing a decrease in unit sales iPad latest earnings report.